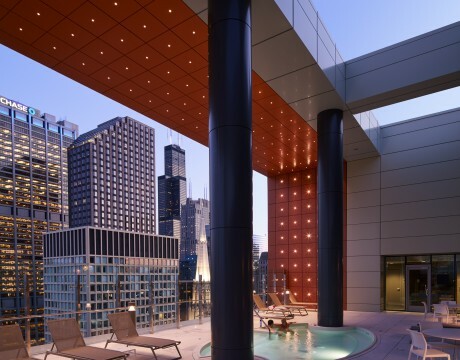 Welcome to Marquee at Block 37's contemporary, high-rise apartment building located in downtown Chicago. Our studio, convertible, 1, 2, and 3 bedroom apartments feature upscale finishes, spaces filled with natural light, and unique lake and city views from the heart of the Loop. With an unmatched downtown location, Marquee at Block 37 offers instant access to everything that makes Chicago a remarkable city, beginning with the shops at Block 37. Here, a variety of urban retailers offer the latest fashions, coffee and other daily delights, casual dining, spaces to meet, an 11-screen dine-in movie theater, and more. Ease of access to the CTA Red and Blue lines and the Chicago Pedway puts the entire city within your reach. Drop by and visit us at our leasing center, located at 25 West Randolph Street or schedule your tour today!